Summer is the season we pet owners dream about: Long hikes and longer swims with our dogs, warm sunny spots on the rug for our cats, and an abundance of fresh air wafting through our homes. But it’s also a time when special care should be taken for your furry family members, because seasonal hazards from hot cars to pesticides can be deadly for them. Here are five steps to take to ensure your dog days are happy ones. 1. Do not ever, under any circumstances, leave your pet in an unattended vehicle, period. I don’t care if the A/C is on or the window is cracked. Leave your pet at home if you or a companion cannot be in the car at all times. We all eye roll at this, but yet every summer the local news is full of reports of Good Samaritans trying to break into a car with a dying dog in it. Cars get up to 150 degrees inside very rapidly. 2. Keep cool, fresh water and shade available at all times, indoors and out. If your pet is an inside one, a fan may not be sufficient to cool them when the mercury rises. While a fan may feel fine on our skin, they process heat differently and may need help cooling down. Setting the air conditioner on Energy Saver mode at 76-78 degrees Fahrenheit is helpful. If your pet is outside, do not rely on a doghouse to keep them cool. The Humane Society notes that doghouses actually get hotter inside than out, and a better solution is tree shade or a tarp shelter. Again, be sure fresh water is available and not left in the sun. If you are tempted to tie your pet up outside a store or coffee shop while you run inside, think again before doing so. If it’s brutally hot and there is no shade or water, you should leave your dog at home. If your pet demonstrates signs of heatstroke—difficulty breathing, wobbliness, glazed eyes, excessive drooling—know how to treat them immediately. 3. Avoid spraying pesticides to treat your lawn and house around your pets (and obviously other animals, including wildlife and farm creatures). If you have sprayed your yard, read the instructions and allow the time stated before allowing family members (including pets!) to access the property. Better still, research an eco-friendly exterminator or product. Many household insect killers are lethal to pets, and worse, are killing off our honeybee and butterfly populations. If an exterminator or pest-control product has been used indoors, again, keep your pets away until the area is safe. Common treatments for summer pests like ants can create issues if breathed in by your cat or dog. Provide proper ventilation at all times, and if a fogger is needed, everyone should stay elsewhere until it’s safe to return. 4. BBQ foods can be man’s best friend, but your pet’s enemy. Don’t drop the ice cream. Or chocolate icebox cake. Or olive dish. Or chicken bones. Or sliced onions for the grilled burgers. 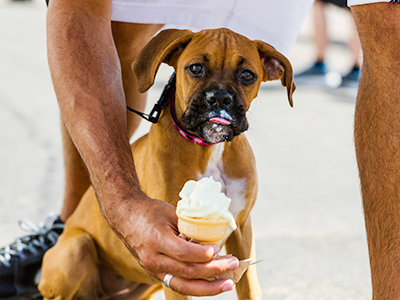 Many summer treats are deadly to pets, including chocolate, garlic, onions, olives, raisins, and more. Dogs can choke on discarded ribs and other bones. Keep food guarded above snout level at picnics and parties. Cats can also be tricky with sneaking snacks, and they often hate the stress of company. Best to keep them safe in a cool room with food and water—just don’t forget to sneak them some nice, juicy nibbles of chicken breast later. 5. Buddy exercising is great for both of you, unless you overdo it. Taking your dog for a jog or a playdate on the beach? Go in the early morning or after sunset, not during the hot peak midday hours. Be sure to get your pet in the shade every 30 minutes, and offer lots of water (especially at the beach, where they don’t have many freshwater options) via a portable doggie bowl or water bottle from your cooler stash. Contrary to popular belief, animals can get sunburned, too. Many pets die annually of skin cancer. Spray your dog (or horse!) with pet-friendly sunscreen and keep your cat out of the window for long periods of time on sunny days. A great option for the beach is a sun shelter for your pup (and you can join for an afternoon nap). There are even sun-protective UV clothing options for pets, particularly those with short hair or exposed skin and light fur.